As a student, I often said “I can’t wait to be a real OT”. At the start of April, I will have been in my first occupational therapy post for six months. So does this mean I am now “real”? My transition from student to practitioner has been exciting and squee-inducing, but it has also had its challenges. As I prepare for my six-month review, which coincides with #OTalk on Tuesday 2nd April (‘The Transition to Newly Qualified OT’), I realise what a Roller-Coaster Ride the last few months have been. 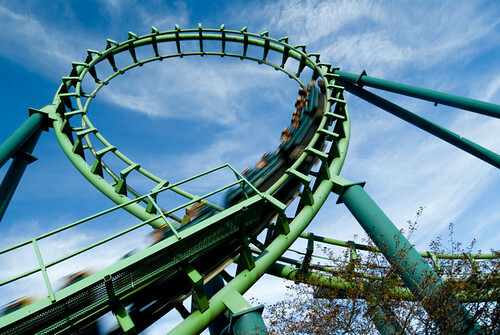 For me, the most uncomfortable part of a roller-coaster ride is the first ascent: being slowly pulled towards the unknown – never fully confident that the anti-rollback device will hold – and realising that I no longer have the option of changing my mind. Of course, the discomfort I feel at this stage is mixed with excitement, and hope that the thrill will be worth the time spent queuing. In many ways, this mirrors the anticipation of waiting to start my new post. Tryssenaar and Perkins (2001) describe this stage as one where a “thread of concern” is “woven within the eager anticipation” (p. 22). Waiting for pre-employment checks to come through felt like an eternity. I was so excited to “finally be A Real OT”. But as I slowly neared my start date, I began to wonder whether the three-year “queue” had sufficiently prepared me for the challenge. The strongest memory I have of roller-coasters is the first drop – feeling so bewildered by my apparent inability to scream that it takes a few moments to notice what is happening in my environment. My first weeks in post were overwhelming. I had suddenly gone from being a skilled student to being a novice practitioner. I experienced a lot of self-doubt and struggled to balance my own expectations with the reality of practice. As a student, I had been used to having an educator to observe. Not having another occupational therapist on the ward left me with a lot of uncertainty about what “good enough” looked like. I compared myself with the senior occupational therapists on my elective placement – and was not measuring up. Somewhere along the way, the ride has smoothed out. I feel more confident and in control of the direction of the ride. I am enjoying “the routine of clinical practice… one of discovery and learning from clients and testing out one’s own clinical judgment” (Rogers, 1987, cited in Tryssenaar and Perkins, 2001, p. 20). I’ve also realised that I’m not alone: I have a whole team of people in the car with me. Every now and then, something happens that makes me feel exhilarated and almost weightless – like those moments on a roller-coaster where it feels like your body is leaving the seat or your stomach has dropped through the floor. More and more, I am experiencing pride in my work, and recognising my achievements (rather than feeling almost guilty that my patients are “stuck with” me instead of a more experienced or skilled occupational therapist). However, I continue to face steep learning curves. Each time I reach the top of a hill, I realise how much further I have to go. I have to continually remind myself to experience the ride moment by moment, rather than allow myself to become overwhelmed by the enormity of the full circuit. Preceptorship – I have been fortunate to work in a setting that supports preceptorship (a structured transition period). Although I initially found it frustrating to focus on pre-set objectives rather than my own priorities for development, I have come to appreciate this structure as a “break” system, slowing me down and ensuring that my development is balanced. Preceptorship Peer Support – Meeting every few weeks with my newly qualified nursing colleagues has normalised my experiences. Through honest and open discussions, I have realised that others share my insecurities and frustrations. This is consistent with the experience of Smith and Pilling’s (2007) participants: “realising that feelings of inadequacy and uncertainty were common was reassuring for participants. Group discussions of feelings and experiences were reported to decrease emotional isolation…” (p. 271). Reflection – I have heavily utilised reflection as a way of coping with reduced support and supervision. As a student, I rarely wrote reflections (as I favoured “doing it in my head”). But I have realised that by writing my reflections down in a structured way, I not only focus better and reflect more deeply, but I also provide ongoing evidence for my preceptorship/Knowledge and Skills Framework. Continuing Professional Development has become “a vehicle for professional socialisation” (McKinstry et al, 2009, p. 141) and a way for me to independently monitor my development and competence. Personal Learning Network – My personal learning network has been an invaluable source of personal and professional support. I am fortunate to know many wonderful people who have been there to provide a safe space for processing, support my reflection, re-ignite my interest or just give me a hug. Like a roller-coaster, I only have a limited amount of energy available to complete the circuit. I remember feeling completely exhausted after placements, having spent my evenings and weekends reading and preparing. I knew this wouldn’t be sustainable in the longer term. Since starting my post, I have been strict with myself about leaving work on time, taking my breaks, and not using my personal time to prepare. I have missed having “study days” and will admit that I continue to use my own time for continuing professional development. I have had to make a real effort to “practice what I preach” with regards to self care and occupational balance. Arguably, as occupational therapists, we are at an advantage as we have experience of teaching our clients to use these skills (Cox, 1988, cited in Bassett and Lloyd, 2001). However, the pursuit of balance still requires honesty, reflection and active choices (Clouston, 2011) and is an ongoing challenge. We will be discussing the transition from student to practitioner on Tuesday 2nd April, 8pm GMT using the #OTalk hashtag on Twitter. I look forward to hearing about other peoples’ experiences or expectations of the transition from student to practitioner. Here is a link to a transcript of the #OTalk discussion about the transition from student to practitioner (opens in new window). Clouston, T. (2011) ‘Worked Out and Still Wanting: Finding Balance in Busy Lives‘ presentation, Occupational Science: OTs Owning Occupation Conference, 8 September, University of Plymouth, UK. Previous postPsychological Approaches: Enhancing Occupational Therapy or Filling Gaps? Next postIs Boredom More Than an Emotional Response to a Lack of Occupation? This is a fantastic post. Love the metaphor of the roller coaster. Amazing! I thinking you’re doing a brilliant job, and while we were students, I felt like you were already an OT. I wonder if I should write a post about the transition from OT student to non-OT professional, which is becoming more common in the current economic climate? Thank you Munchkn. What a great idea, writing a blog post about your own transition! If you write it before Tuesday, we could share/discuss it in #OTalk? Danielle, do you mean you are working in a non-traditional setting as an OT (even without the title) or as something else entirely? Your blog posts are always so interesting. I started blogging with the best intentions, but find it so difficult to maintain alongside studying. Anyway, thank you for your helpful advice- it’s really reassuring and informative!